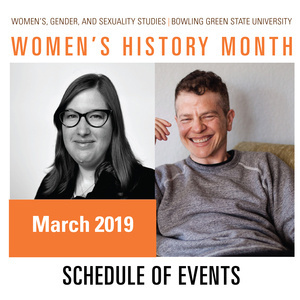 Join us all month at BGSU as we celebrate Women's History Month! 242 Shatzel Hall | 2-4 p.m.
206 BTSU | 7:30 p.m.
228 BTSU | 4-6 p.m.
207 BTSU | 2-4 p.m.
206 BTSU | 2:30-5 p.m.
Arts Village (101E Kreischer Residence Hall) | 1:00-2:00 p.m.
206 BTSU | 6-8:30 p.m. DENIAL manages to present insights into two important topics - one global and one personal - through a funny, informational, and enormously compelling personal narrative, and at the same time to throw light on the messy business of change. 201 BTSU | 10 a.m.-2 p.m.